regattas and off shore competitions in Latin America. Patagionia lands. Mr. Hortencio Aguirre Anchorena and some of his closest friends got together after the amazing experience and decided to open the Yacht Club Argentino. these chick events havent stopped ever since. 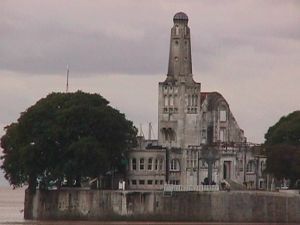 Located in the port area of Argentinas capital city Buenos Aires, the Buenos Aires Yacht Club lighthouse was built during the late 20s of the twentieth century. Its aesthetics had been marked by a world-wide architectural trend: Art Decó. One can see in its delicate straight lines how the architects in charge of building this lighthouse blend functionality and art, including many decorative inputs to the basic construction, mixing up different materials to get the most out of each one of them. The BA Yacht Club is located in the Puerto Madero area that during the early years of the twentieth century was the citys most important port, today its busy port days are over, it has become one of BAs most exquisite places. Old port houses have been renewed into gourmet restaurants of outstanding quality, out of the top hotels, a very exclusive residential area, and of course our citys Yacht Club, a majesties gathering point for outdoor activities for all the family. appeared, and were very welcome by our society, and still are. hours away from BA, in Uruguay. The over the top summer resort that welcomes the crème de la crème of all Latin America, and during the last few years has also been the chosen destination for many Americans and Europeans for its gorgeous beaches, its broad night life, and of course, because it is proven that Punta as the frequent visitors call it- is the top place to be in during January and February. The famous summertime regattas go from the Argentinean Delta to the Punta del Este port. The Delta also hosts famous regattas, very well known for their international level. Mar del Plata, the seaside host to these events has historically been a luxurious beach resort in Argentina, offering the visitors the best of our traditions and lifestyle.